The entire world is in danger of a resource crisis. As human population grows and the demand for natural resources increases there will be a shortage in many commodities including strategic elements. Without strategic elements such as platinum group elements, rare earth metals and phosphorus, maintaining global populations and the global economy will become exceedingly difficult. The largest aspect of the problem is not that we will "run out" of strategic elements, but rather that demand is projected to increase to alarmingly high levels in the near future, which will hamper the progress of energy-critical technologies as well as many consumer products. For example, a global REE shortage would prove disastrous to the future of many existing consumer products, such as fluorescent light bulbs, X-Ray machines, and glass. However, as developed countries continue to pursue alternative energy, clean transportation and other technologies, the stress on REE suppliers will increase rapidly until demand surpasses an already declining supply. For example, neodymium is projected to become a limiting factor for the production of hybrid car models, due to its use in permanent neodymium alloy (NdFeB) magnets (Shaw, 2012). Demand for permanent rare earth magnets used in developing energy technologies is expected to increase by 60% by 2017 and will accelerate to 200% of current demand by 2020. Supply for rare earth magnets at current levels will lag behind these demand increases, which will gravely affect the affordability of clean energy technology (Roskill Estimates, 2012). World demand for heavy REEs used in consumer-grade products with phosphors and pigments is set to increase by 50% by 2017. In addition, the use of dysprosium in heat-resistant alloys, which are present in wind turbines, means that the demand for dysprosium will increase with the use of wind energy (Moss, 2011) (Roskill Estimates, 2012). Analysts predict that the demand for dysprosium will outstrip existing production levels within 25 years (Alonso, 2012). A potential disturbance in the supply of REEs would threaten not only modern technology, but also the advancement of innovative technology. 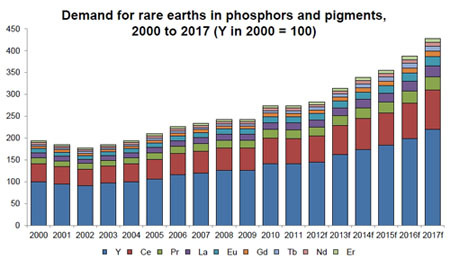 Demand for 9 selected Rare Earths in Phosphors from 2000 to 2017 (projected). Adapted from: "Global drivers for rare earth demand", Shaw, Suzanne and Chegwidden, Judith, 2012, Roskill Information Services. Another issue with the current state of REE production is that global distribution of suppliers is extremely limited. Currently, China is responsible for an overwhelming majority of the world's rare earth supply, and has been continually restricting its exports since its rise to the top. Trade disputes between China and the world's largest REE consumers—namely Japan, the U.S.A., and the EU— have become increasingly heated. In fact, this year, President Obama called for the WTO (World Trade Center) to reprimand China because of its near-monopoly of the market, claiming that the country is beginning to threaten the ability of the U.S.A. to "manufacture advanced batteries and hybrid cars" (Morrison, 2012). Although China claims that it does not plan to use rare earths as a "bargaining chip" (China Daily, 2010), as long as China continues to reduce its rare earth exports while maintaining its dominance over the market, trade relations between China and its trading partners could worsen. For the average person, it may be easy enough to see firsthand the effects of OPEC's control over oil; the subtle effects of China's control over REEs and strategic elements are equally concerning. A potential resource war over the REEs could become a terrible reality unless the market begins to diversify production away from China and its state-owned mining conglomerates. If nothing changes about the way the world consumes fissile elements, there is also risk for a long-term resource bottleneck. Estimates suggest that East Asia's nuclear capacity is set to increase by as much as 185% by the year 2035. Europe is also set to increase its nuclear energy production by as much as 125% (OECD NEA, 2011). Presently, the production nuclear energy is relatively diverse and sufficient to satisfy global demand for uranium but further global investment in nuclear energy means an increase in demand for the future. Other strategic elements, such as the rare metals and the platinum group elements could become the cause of very pervasive social and economic crises in the developing world. Already, tantalum and niobium ores (together forming coltan) are the center of an ongoing human rights crisis in the Democratic Republic of Congo. South Africa recently quelled a labor strike by platinum miners, where violence between law enforcers and strikers resulted in the death of more than 40 people. These South African mining companies are also planning on moving operations to Zimbabwe, which would put the citizens of this politically unstable nation at similar risk of labor related violence. Simply following the status quo will cause these problems to persist, or even spread to other parts of the globe. In addition, the lack of environmental safety protocols for mining of both Rare Metals and PGEs in underdeveloped countries could present a serious problem to the local health of the citizens of these regions. The cost of inaction on declining stocks of phosphorus is particularly concerning. Many analysts fear that, although phosphorus may seem plentiful, global consumption of phosphorus is going to increase at rates higher than suppliers will be able to support. Phosphorus is critical for agriculture as a nutrient in fertilizer and livestock supplements. Phosphate use in modern agriculture enabled the human population to grow from 3 billion in 1960 to over 7 billion today (US Census Bureau). If the world's supply of usable phosphorus is depleted, sustaining a large human population will become considerably more difficult. If the world does not quickly take steps to change how phosphorus is consumed and produced, a potential resource crisis would devastate global agriculture and threaten food security. It's not too late to change the future for strategic elements. Countries such as China, the Democratic Republic of the Congo, and Morocco have the ability to severely impact the growth and security of other nations based on their access to and control over strategic elements. As a resource bottleneck for certain strategic elements reaches near a tipping point, many environmental, societal, and political issues develop. The state of global commerce must change to account for increasing demand and changing markets, or the consequences could be monumental. Shaw, S., & Chegwidden, J. (2012). Global drivers for rare earth demand.Roskill Consulting Group. Uranium 2011: Resources, production, and demand. (2012). (Executive Summary). Rare earth will not be used as bargaining chip: Wen: OECD Nuclear Energy Agency and the International Atomic Energy Agency. Vaccari, D. A. (2009). Phosphorus: A loomıng crisis. Scientific American, (June 2009), 54.